Bhaiya Dooj (भय्या दूज), comes once a year after diwali on second day of bright fortnight of kartik (this year Sat, 21 October 2017). The sister applies the tikka on the brother’s forehead. The Puja is usually performed in the mother’s house before the brothers leave for work or study. Bhai Duj is also called 'Yama Dwiteeya' as it's believed that on this day, Yamaraj, the Lord of Death and the Custodian of Hell, visits his sister Goddess Yamuna, who puts the auspicious mark on his forehead and prays for his well being. So it's held that anyone who receives a Tilak from his sister on this day would never be hurled into hell. According to one legend, on this day, Lord Krishna, after slaying the Narakasura demon, goes to his sister Subhadra who welcomes Him the lamp, flowers and sweets, and puts the holy protective spot on her brother's forehead. 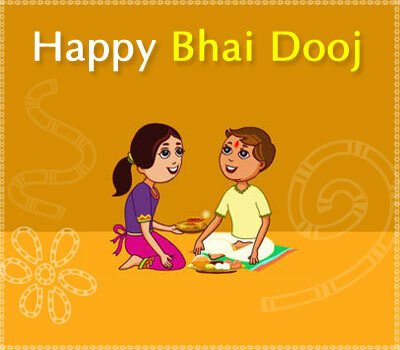 Bhaiya Dooj is a day dedicated to sisters. We have heard about Raksha Bandhan (brothers day). Well this is sister’s day, that anyone who receives tilak from his sister on this day will never be thrown.